Is Cashcrate Legit? Or Is This Just A Scam? Last updated on July 17, 2018 By Nat 4 Comments This post may contain affiliate links. We appreciate you supporting Rags To Niches! Full disclosure here. Is CashCrate Legit, Or Just Another Scam? Cashcrate is a quite a bit more than your regular survey site, it’s general feel and appearance reminds me Swagbucks. While I’m not a fan of spending much time on sites with low earning potential, I am interested in finding some of the best sites of this kind. Is Cashcrete legit? Yes, Cashcrate is a legit site, it’s not a scam. But is it really worth your time? You won’t be making a fortune here, but you can certainly make a little bit extra cash. Read on for my full Cashcrate review to find out more details! Earning potential: Pocket money, (with higher potential referring others). 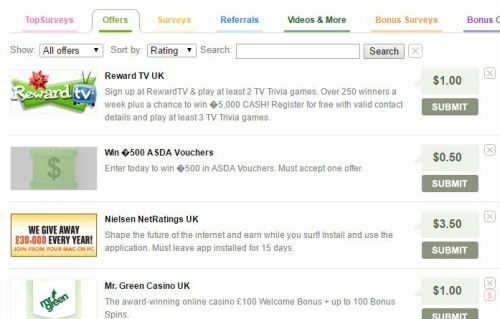 Review in brief: I found Cashcrate to be quite an enjoyable and fun site where you can earn cash rewards for surveys, cash offers, watching videos, mini tasks, contests and referring others. While you won’t make a fortune, at least there is a variety of ways to earn a bit of extra cash. However, what I don’t like about Cashcrate is its’ high payout threshold and there have been some mixed reviews too. What is Cashcrate? – first impressions. Cashcrate is more than just a survey site – it’s what I term an “all rounder…” But many people may describe it as a GPT site, (get-paid-to site). This is because Cashcrate incorporates cash offers, money for watching videos, shopping cashback, playing games, using their search engine and a reasonable referral program. I was quite impressed upon arrival to, the website looks appealing and fun. Bright and inviting, the look of it stood above many of the survey sites I’d previously joined. It was also easier to navigate than many similar sites. As soon as I signed up, I was able to earn my first 50 cents by completing my profile, which took a couple of minutes. I liked how they paid you in cash for one of the first things you do on the site, it gives you reasonable hope for what is to come. I could then watch a video to see what to do next. The video talks about some of the best ways you can make money via Cashcrate. How Can You Make Money With Cashcrate? There are several ways that you can earn money with Cashcrate. Using their search bar, (as you would a search engine). Cashcrate suggests to you, (in their intro video) that the quickest way to make money is by completing cash offers… So, we’ll look at that first. Companies pay you for interacting with their product or service, such as by getting a trial offer, playing a game, answering a survey, or signing up for their service. Some offers require a credit card or make a payment and these do have higher payouts. For example, one offer was for $20 dollars to join an online casino. You needed to make a deposit of £10, (I’m in the UK, this is equivliant to $14) – but that would mean you’d make a $6 profit overall. Plus you get to spend $14 in the casino for free. You got $3 for signing up, but you’d need to remember to cancel the free trial. Filling out multiple cash offers is not a good way of making money seriously and especially not long term if you’re doing it yourself. But it’s fine for a bit of fun and a little extra pocket change. But additionally, you will need to remember to cancel any subscriptions you have signed up to on trial! If you don’t cancel some of these subscriptions, you’ll be charged. You will need to make you’re you’re very organised and make notes of what you’re signing up for. Also, I’d suggest you go for reputable companies than you are already aware of and trust. Spam, whether by email, mail, phone or text can be relentless if you give your permission to be contacted. Very often, you won’t realise you have given your permission and it will be in the T&C’s. Make sure you check out all the tick boxes when you sign up – they’re created to confuse you! I’d also recommend taking screenshots and keeping email confirmation for any of the offers that you complete. This will come in handy if your offer isn’t tracked and you need to prove that you completed it. When I arrived at Cashcrate, there were only 15 offers available to me. That is, different things I could sign up to in order to get cash from Cashcrate. I’m not sure if 15 or so offers is standard, or if they increase the longer you’re there. It’s probable that you have more available to you in the USA and perhaps this will improve over time. I really didn’t want to risk getting spam, I decided to sign up to their “reward TV – trivia games” offer. I added an email address that I didn’t mind being spammed and it didn’t ask for my credit card, nor my telephone number. I played a few trivia games, it took around 5 minutes and I made $1, which was credited immediately. By contrast, there were pages and pages of bonus offers. Mainly they were casino/bingo based. If you’re into casino’s and playing bingo, then signing up to these offers may be worthwhile. In addition, once you’ve signed up – that’s it, you can’t sign up again so these offers will be a one time thing. While there were some FREE bonus offers, (that you didn’t have to pay for) these were very limited. They were also very low money wise, often under $1. 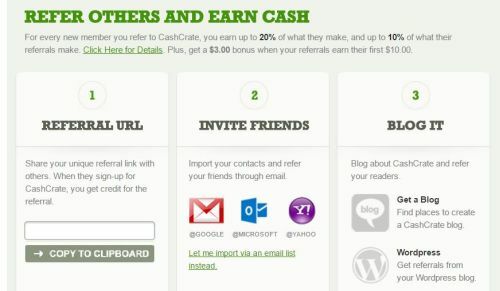 Cashcrate has a good referral program, this means you can make money by referring your friends and family to Cashcrate. However, you won’t make much money just by referring a few friends – if you have a popular website/blog/YouTube channel, then this would be better. Personally, I didn’t have much luck with the Cashcrate referral program. Literally everyone that has signed up under me has not completed anything and hasn’t made money… But hey, that may just be me! Over time, I have realised how common it is for people to simply not take action to make money on get-paid-to sites and survey sites. Or, they may take action very briefly, (take a couple of surveys, for example) and then get bored and leave. I’ve found referrals have taken the most action using Swagbucks. Although, even in that case – most of the referrals don’t remain active for long! So, most people will not make money from the affiliate program, unless they have a very good system set up for getting active referrals. The referral amount you receive is based on a tiered system, which is unique in comparison to most other related sites. You will receive 20% of any money that the people you refer earn, as well as 10% of what anyone they refer themselves earn. You also get a bonus when your referral makes their first $10, (you get $3). Cashcrate do claim that some are making hundreds or even thousands of dollars with their referral program. While I have no doubt this is true, it is a little misleading. They won’t be making a tonne of cash by just referring their friends of family. There are also tiers to their referral program. Once you’ve referred 50 members, who all complete at least one offer, you become a silver member and can earn 25% from each referral. There is also an elite rank, which raises your commission opportunity to 30% for direct referrals and 20% for those who are referred by your referrals. It didn’t state how many you needed to achieve this level. Anyway, if the referral program is not for you, there are other ways you can make money. Although, this would be the most profitable way, you would need some skills and knowledge about affiliate marketing to really be successful. Useful Post: 40+ ways to make your first dollar online. There were 15 surveys available to me after signing up – ranging between around 10 cents and $1.50. The first survey I tried was 47 cents, it took around 10 minutes and again I was credited instantly afterwards. I also managed to complete the first survey all the way through, without being chucked off halfway through for “not qualifying,” which has been my experience with many other survey sites. However, this did not last. Other surveys I tried, I was thrown off multiple times. Even answering several questions and giving some personal details, (such as email). I really dislike this problem with a majority of survey sites. Regarding the surveys , you’re often redirected to other well known providers. Such as: Ipsos Isay, opinion outpost and Global Test Network. I had no problem with this, but it can delay things a little connecting to them. There was also a small selection of “Top Surveys,” available for me to try – (five in total for me). As you can see above, one was worth almost $9. Unfortunately, I didn’t qualify for that one, (again!). But it shows some potential for some more higher paying surveys available, (if you can actually answer them all the way through!). Top surveys are based on previous topics I’d already answered, so the longer you’re at Cashcrate, the more accurate these top surveys will be matched to you. Certainly by checking out some of these top surveys each day, you have the opportunity of earning much more than the regular ones. Unfortunately, there were no videos available for me to watch! This was a bit disappointing, after hearing someone else had made a 5th of their Cashcrate income via watching videos. However, I have a feeling this could be due to me being in the UK, if you’re from the US you may find plenty more available. They have a new shopping section, presumably so you can earn cashback or points on purchases, (much like Swagbucks). Unfortunately, there was nothing available when I signed up! (Again, presume this is because I’m in the UK – US will be better). I was pleased to see that there is a fairly large and active forum here. It had been recently active, which is good to see. Right away, I noticed a success post: “$2000 on Cashcrate.” However, that $2000 had been accumulated over two years. That being said, that’s still some reasonable pocket change – something you could use to save up for a holiday or similar. Also, they said they had got this by primarily entering surveys, offers, contests and bonus videos, (bonus videos making a 5th of their earnings). There were also people posting their earnings, within the hundreds of dollars, from using the referral program. What Do Other People Say About Cashcrate? Survey Police – Cashcrate has 3 stars. People have general complaints – that could be applied to many other sites. Some say a lot of the surveys are too long, for a low reward. High screen outs, (which I did experience). People also claim the high payout threshold is way too high and I would agree with that. SiteJabber – Cashcrate has 2 stars.. But there are only a small amount of reviews here. (39 at the time of writing). I noticed someone also wrote a good review, but only gave 2 stars for some reason. Generally the negative comments are general comments that any survey site could have – such as not qualifying for surveys. Some people complain about spam, (another common issue with paid offers, check the T&Cs). I recommend using a separate email/tel number for completing offers. Trustpilot –Cashcrate has 3 stars. (only 5 reviews at time of writing). I am surprised there aren’t too many reviews online, I would have thought there would be more here. Really, as there are only a small number of reviews, it was one 1 star review that brought the average down. CHECK IT OUT FOR YOURSELF…. Bonus surveys and Top surveys pay more. You make 3 cents for logging in each day. You can also make money by using their search bar – like a search engine. Only pays by check – no gift card or paypal options. Completing cash offers can lead you open to Spam and you also need to remember to cancel any trial offers. You may get chucked off multiple surveys for “not qualifying,” which really gets frustrating – this is the same with a majority of survey sites however. 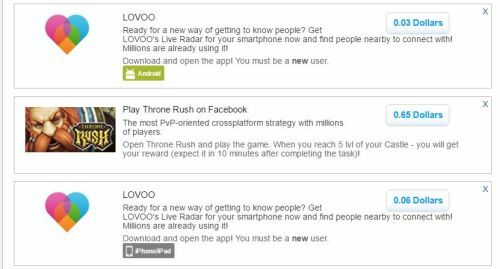 Bonus surveys – click on the free tab and then popular, to get the best deals that are also free to join. (while some may only be a few seconds, they do take seconds). Go to the free rewards – you can then sign up to simple offers without the risk of your credit card being charged. When you’re going through offers – check your offer isn’t already in “bonus offers” first – in case you can get a better offer there. Check out the Top Surveys each day, so see if there are any high paying ones available. 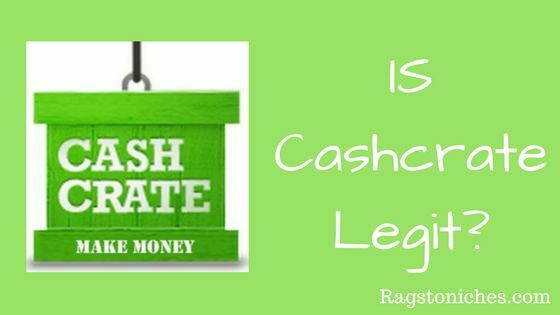 Conclusion – Is Cashcrate Legit, Or A Scam? As I’m sure you have concluded already by reading this review – I do think that Cashcrate is legit, even though it does have some issues. There are a lot of people online that hype this platform up as well, because it does have a tiered affiliate program. Just don’t sign up thinking you will make much, because a mass majority will not make much at all. If you’re interested in checking out GPT sites, then this one is worth you checking out… see what you think! I hope you found this review useful. However, if you’re looking to make more than just pocket change online, I don’t recommend wasting much time on survey sites. At the moment, I make the most money online through affiliate marketing. If you’re not sure what that is, it’s pretty easy to learn the basics – that’s exactly what I did. Click here for the exact training I followed to make my first $1000+ online. what is your experience of survey related sites? Are you a Cashcrate member? Sorry! I got so distracted by your Forever Living page. I’ve encountered this MLM company and I think they are a scam. Anyway back to this page, I got into this sort of stuff until I had to sign up to a bingo offer which was impossible to do. I have been hardened to these sort of sites and think they are all scams. I agree with your pros and cons but disagree fundamentally with you- they are scams! But that’s my opinion. Hi, Yeh I’m not a fan of Forever Living either – but I wouldn’t say they are an outright scam. As far as this goes, some of the offers definitely work, I’ve completed them myself. You can definitely make money on Cashcrate – in the majority of cases, you do not make much at all, but I don’t think that just because you don’t make much money on it that it’s a scam. In my opinion, Cashcrate definitely isn’t a scam. It’s just not a great way to make money online. Thanks for your comment! I’m not a fan of CashCrate. If you make any money at all, it won’t be much. Your suggestion for learning basic marketing skills will earn far more in the long run. I’ve tried other survey sites and find them to be mostly a waste of time. CashCrate seems to me to be more of a marketing company than a legit research company. Your time is far more valuable than anything you might earn at CashCrate. I encourage people to learn the basic marketing skills as suggested here and build a real online business. With a real online business, you can earn money that will change your life. I agree that people should put their time into learning a real long-term business online that will be benefitical to them. However, not everyone has any interest in doing that. Some people just want something they can do with very little effort and earn a bit on the side… granted, you will not earn much at all from doing this. But as far as survey sites go….if that’s what you’re looking for, I found this one better than a lot that I have gone to. I also like Swagbucks, which is very similar to this.